Women’s eyeglasses have come a long way in the last few decades and in today’s eyewear market there is an abundance of options. 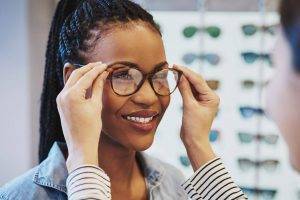 With constant innovations in style, comfort, and quality, eyeglasses have become as much a fashion accessory as a medical device to improve vision. In addition to all of the optical companies creating eyeglass frames, many of the major designer fashion lines have come to incorporate eyewear into their portfolios as well. So, when it’s time for a new pair, where does a woman start? When you shop at an optical store, the optician is trained to help you select the right pair of frames. This decision should take into consideration your personal style, your lifestyle and your appearance. The right frame will look great with your complexion, coloring and face shape, feel comfortable and suit your needs in terms of flexibility, durability, cost and style. 1) What shape eyewear looks good with my facial structure? If you currently have eyeglasses, do you want a similar shape? 2) What color eyewear compliments my complexion? What colors do I like? What colors are predominant in my wardrobe? 3) What style do I prefer? Modern or retro? Classic or contemporary? 4) Where do I wear my frames in general? To work, out on the town? 5) Do I play sports or engage in activities that would require durable glasses? 6) Do I have young kids that might pull my glasses off? 7) How much am I willing to spend on my eyeglasses? 8) Do I want to get coatings on my glasses (anti-scratch, anti-glare etc) or consider transition lenses that darken in the sun? Armed with this information, your optician will have a much easier time assisting you in finding the perfect pair. Once you have narrowed down the options, you want to make sure that the pair you choose fits well and will be comfortable for extended use. You don’t want to have any reason not to wear your new eyeglasses! Make sure the frames are the right width for your face – that they don’t slide off when you look down or press on your temples or behind your ears. The frames should be snug but not cause any pressure. Also pay attention to whether they fit comfortably across the bridge of the nose. Lastly, make sure that your eyes are completely within the frame where the lenses go so you are not looking over the top of the frame. If you can’t find one perfect pair, you can always consider buying a second pair. This way you can mix and match depending on your outfit and your mood. Request your next appointment by filling out this secure online form. Please include your preferred appointment time. For new patients or if instructed by staff. No need to print! You can reach us by email. No confidential information please!